Renowned jazz saxophonist, Greg Osby, tunes his instrument before conducting a jazz master class in Knuth Hall Wednesday, Oct. 15, 2014. Martin Bustamante / Xpress. Students gathered at Knuth Hall last Wednesday to view famous jazz musician Greg Osby who visited SF State to recite with his band as well as educate musicians and audience members. Despite having returned from playing in Poland and landing in San Francisco just hours earlier, Osby looked happy to be at Knuth Hall in the Creative Arts Building. “I’m excited to be here in front of an audience of musicians and students,” said Osby as he adjusted his microphone. Osby addressed the audience with a soft-spoken, smooth voice. Audience members sat and gazed at Osby with their complete attention. With the swift movement of his thumbs and a couple of intricate breaths into his mouthpiece, the audience watched in awe as Osby demonstrated his musical prowess. Though his touring schedule has him running around the West Coast, from San Diego to Seattle, Osby took his time and to encourage the audience to ask him questions regarding musical techniques, answering every question with explicit detail as well as demonstrated examples from his sax. 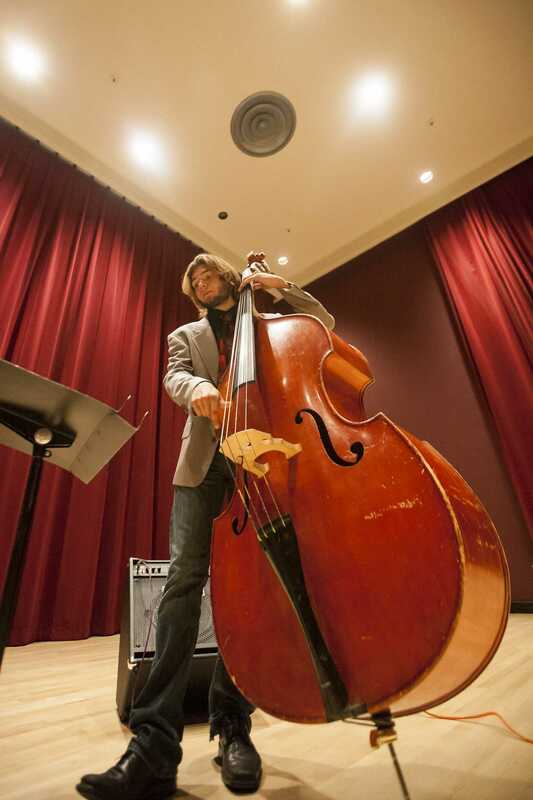 Alex Farrell, a freshman majoring in jazz studies, performs with his trio in Knuth Hall Wednesday, Oct. 15, 2014. Martin Bustamante / Xpress. “I like to parallel playing music with some abstract entities and references,” said Osby as he shared his musical history with the audience. SF State music majors Sam Anderson and Jack Sakai were given lessons from Osby on music playing techniques. Anderson and Sakai are members of a jazz band called The Five Horsemen, with all its members practicing in Knuth Hall before Osby’s recital. With Osby’s instrument in hand, he played with “The Five Horsemen” and entertained early attendants in the audience. In Osby’s hands lay a beautifully constructed saxophone that he helped design with P. Mauriat instruments. Every single detail from the keys and the metals used, to the colors of the metal was specifically crafted under his direction. Sakai, guitarist for The Five Horsemen, diligently practiced with Anderson as Osby taught him and Anderson techniques in rhythm and playing style. As the quick lesson concluded, Dee Spencer, professor and director of music and dance, approached the stage to thank the audience. Osby and Spencer have worked with each other in numerous jazz bands since the ‘70s. Their history of music spanned over three decades and Osby said he was happy to see Spencer again, while Spencer said Osby is a wonderful person to witness when he plays his music. 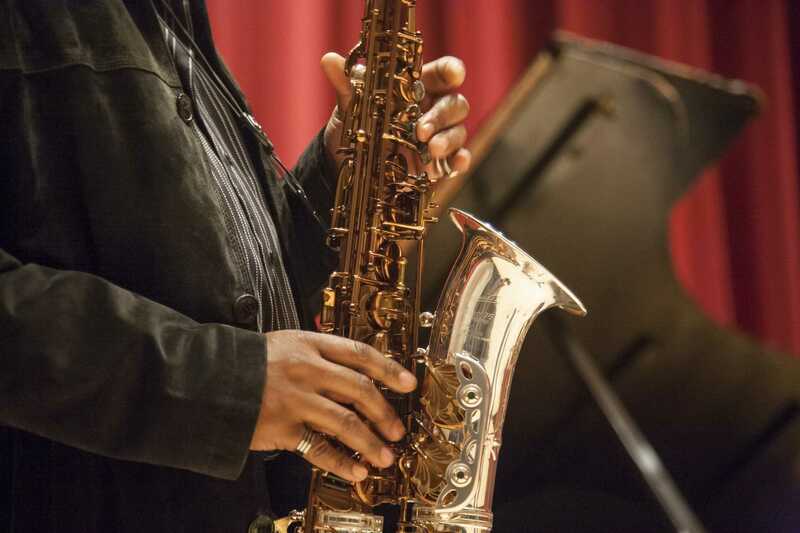 Osby played his alto sax with his band members during the majority of the recital as the sound of Osby’s contemporary jazz playing style filled the hallways of the Creative Arts Building. Osby says that his musical inspirations are not sax players like him, but it is musicians such as Duke Ellington and Charles Mingus that have shaped his playing style. Osby will continue playing throughout the West Coast for the remainder of his 2014 tour. His last show will be in La Jolla in San Diego. 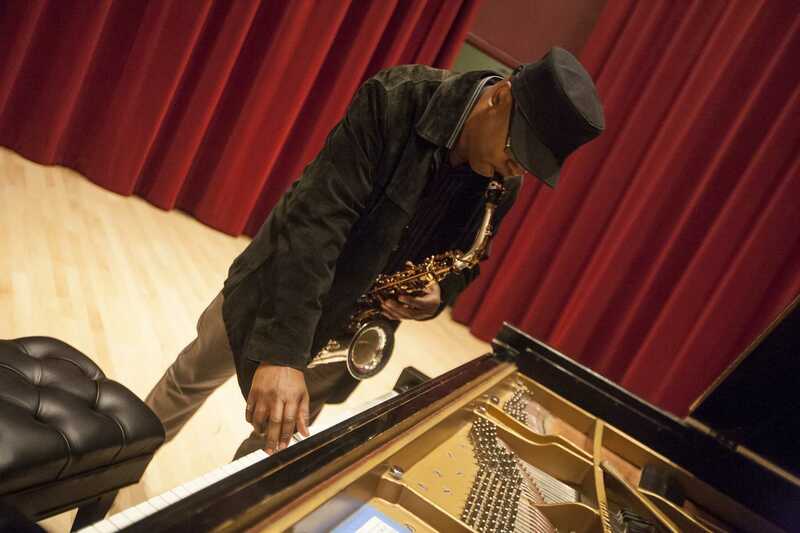 Renowned jazz saxophonist, Greg Osby, solos during a jazz master class in Knuth Hall Wednesday, Oct. 15, 2014. Martin Bustamante / Xpress.